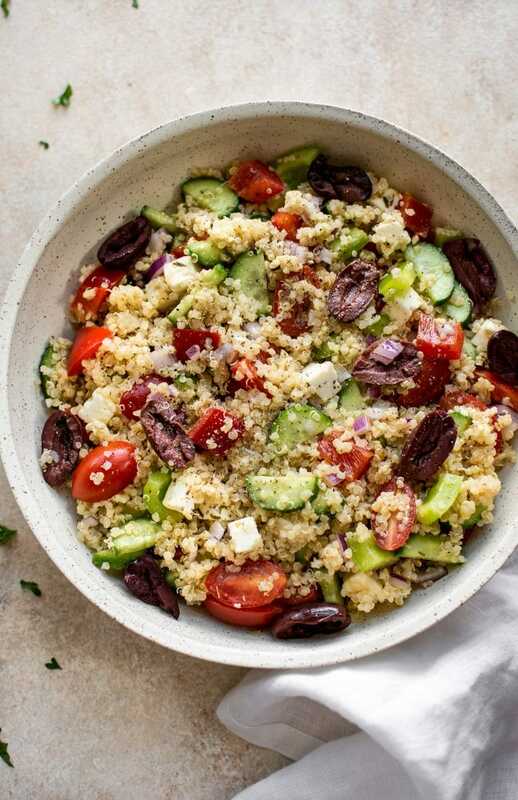 I have quite a few Mediterranean-inspired recipes on this blog, and I figured it was time for another one with quinoa. The other one is a Mediterranean vegan meal prep recipe. 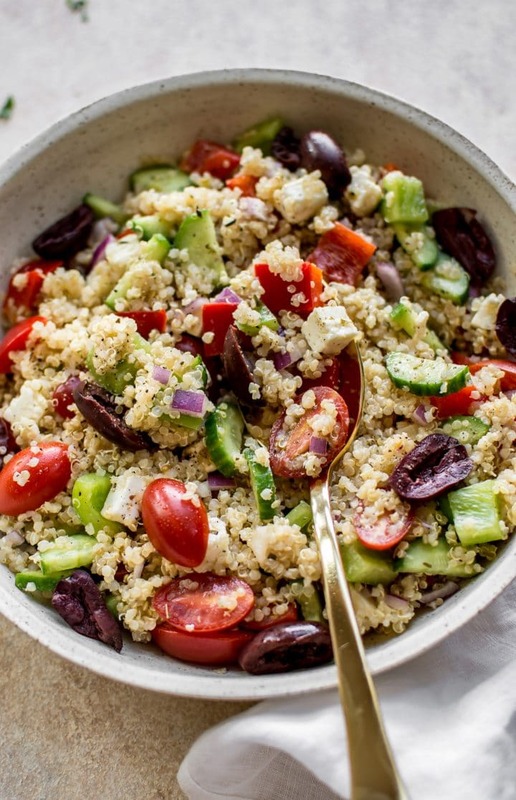 This Greek quinoa salad is great for making ahead. It’ll take you through summer lunches, potlucks, and picnics. I tested this recipe out on my best friend, and she liked it so much that I sent her home with the leftovers. Quinoa is rich in iron, and it’s quite filling without being too heavy. The olives and feta make this salad a meal – you won’t go hungry eating this. If you love quinoa salads, check out my Thai quinoa salad or my ranch chicken quinoa salad. Pro tip: You can easily make this easy quinoa salad recipe vegan by omitting the feta. You could add some chickpeas in for protein instead if you wish. Love Mediterranean salads? Try my avocado Greek salad or my Mediterranean chickpea salad. 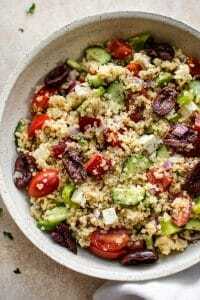 Will you make this Mediterranean quinoa salad recipe? Meanwhile, prep the rest of the salad ingredients and add them to a large salad bowl. 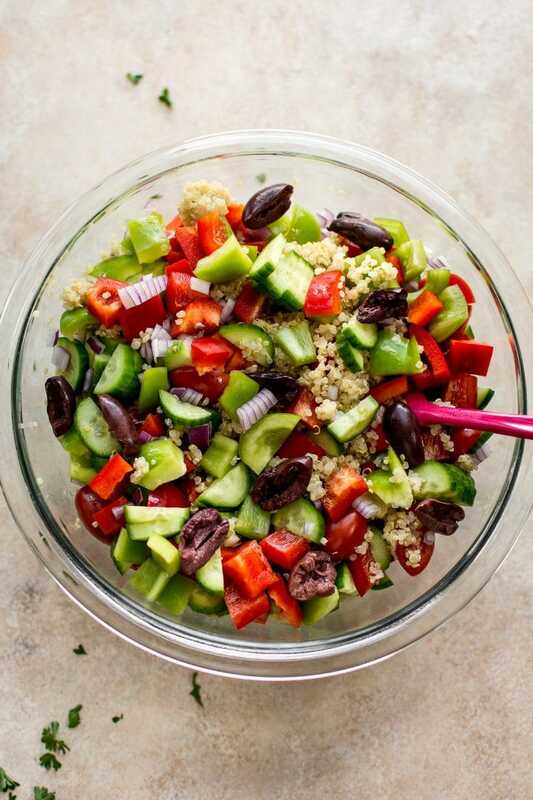 Once quinoa has cooled, add it to the salad bowl. Add the dressing right into the bowl. You may need to adjust the lemon juice/vinegar/oil/oregano quantities to suit your personal tastes. I add a fair bit of salt & pepper to this recipe since the quinoa is not cooked with salt and can be quite bland otherwise. You can chill the salad first or eat right away. Salad will keep in the fridge for a few days. This is truly lunch goals. Adding to my “killer desk lunch” line up! I’ve made this salad three times and it’s the best. Everyone loves it. Thank you for sharing. Aww so glad to hear it, Eva!